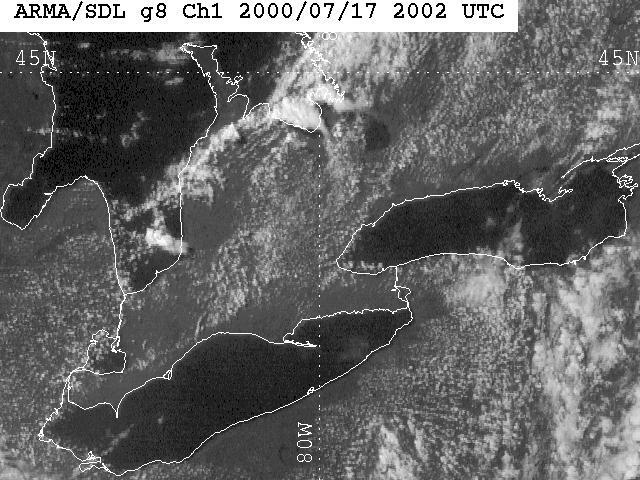 On 17 July 2000, several supercells thunderstorms developed over southern Ontario as a sharp cold front moving southeast across the region interacted with well-developed lake breeze fronts. Severe thunderstorms developed over Grey-Bruce and Barrie-Huronia regions shortly after 1600 EDT. Large hail (up to 5 cm), high winds (likely greater than 100 km/h) and a weak tornado occurred with these storms. Near 1900 EDT, a thunderstorm developed on the Lake Huron lake breeze front and began moving toward the Guelph area from the west-northwest. It quickly developed supercell characteristics and spawned a tornado shortly thereafter. It appears that the Lake Erie lake breeze front was near Guelph at the time and may have provided the low-level vertical vorticity required for tornado formation. The first report of damage in Guelph was at around 2000 EDT (see Appendix A). Several reports were received of damage due to tornadoes between this time and 2035 EDT when a tornado was spotted near Aberfoyle, south of Guelph. Though no tornado warning was issued for the Guelph area, a severe thunderstorm warning was issued nearly three hours before the event (see Appendix B). A damage survey was conducted and one damage track was found (Figure 1). It was initially thought that there were two separate tracks but this was not supported by video evidence received after the survey. Along the track, there were large trees snapped, broken and uprooted, minor crop damage, and minor to moderate damage to buildings and fences consistent with an F2 intensity on the Fujita scale (Fujita, 1981). Overall damage was estimated by Guelph Police to be approximately two million dollars and there was at least one minor injury. later determined to be one track. The number labels refer to the figure numbers for the damage photos. A ground investigation was conducted on Tuesday, 18 July 2000. There were many witnesses to this event so the decision to confirm it as tornadic was straight-forward. Several witnesses reported seeing multiple funnel clouds and this is supported by photos. Thus, attention was focussed on determining the tornado damage tracks and the maximum damage intensity along each track. The first area to be hit was Silvercreek Park at the intersection of Wellington and Edinburgh Roads. Several large willow trees were snapped and broken at this location (Figure 2). The track continued toward the southeast along and to the east of Edinburgh Road. There were several trees and large branches down along this part of the track and swirl patterns in a University of Guelph soybean field. The damage track continued at Rickson Avenue just south of Stone Road and west of Gordon Street. Numerous trees and fences were down in this subdivision. Farther to the southeast, a farm was hit at the end of Harts Lane West. Crumpled roofing material from a large shed was evident. Very large trees were also snapped and lay in a convergent pattern (Figure 3). Figure 2. Snapped willow trees at Silvercreek Park. Taken facing E.
show the size of the trees. Taken facing SE. The track crossed Edinburgh Road at Gordon Street in an area called Hamilton Corner. The damage intensity appeared to increase southeast of this location. The Arkell Church lost the its cloakroom attached to the front of the building (Figure 3). Nearly all of the trees on the south part of Ridgeway Drive were destroyed. Further to the southeast in the Pine Ridge subdivision, numerous houses were missing shingles and siding and several had considerable structural damage (Figure 4). Figure 4. Arkell Road Church with coatroom blown off to right. Taken facing NNE. Figure 5. House on Oak Ridge Cr. with considerable structural damage. Taken facing NNE. The track entered a field southeast of the subdivision, crossed Clair Road and was apparent in a mansion subdivision with considerable damage to new houses there, especially along Kilkenny Place and the end of Serena Lane. One house under construction was completely levelled. The track continued southeast crossing Maltby Road where considerable damage to several homes and numerous trees was found. One house had the entire front verandah removed. The damage track width was found to be near 400 m in this location. Light tree damage was found further to the southeast at the corner of Victoria Road and County Road 34. There was also a report of a camper trailer being lifted and dropped on a car on Victoria Road south of County Road 34. No damage could be found south of this area. All of the damage appeared to occur in a track between 50 m and 600 m wide. There was ample evidence of rotation in the debris with trees down in a cyclonic pattern. There appears to be no evidence of damage due to straight-line winds or microbursts. The damage appears to be consistent with a cyclonically-rotating tornado. There were many photos and some video taken during this tornado event. The following is a selection of images received after the event. and 2022 EDT. Courtesy of Bradley Ivany. cloud to the rear is likely a tail cloud and not a funnel cloud. The following 0.5 deg LOGZ loop from the Exeter Doppler radar shows several showers and thunderstorms moving toward the east as well as two distinct 'fine lines' of clear air echo (mainly grey on the images). The line to the west appears to be a merged Lake Huron lake breeze front / synoptic-scale cold front. The line to the east is the Lake Erie lake breeze front. The parent supercell to the Guelph tornado is intiated at the Lake Huron lake breeze front about 50 km NE of the radar. The blue dot about 80 km to the east of the radar is the Waterloo-Wellington Regional Airport. The following 0.5 deg LOGZ loop from the King Doppler radar shows the developement of the Guelph supercell as well as other thunderstorms to the east. It appears that shortly after initiation, the Guelph storm split into left and right movers with the right mover tracking over Guelph. At 0020Z, note the pronounced 'hook echo' at the NW end of the storm and the 'notch' at the SE end. The actual reflectivities are likely considerably higher near this time since there was strong attenuation of the radar beam by the cells just SW of the radar. The blue dot about 80 km to the southwest of the radar is the Waterloo-Wellington Regional Airport. Below is a GOES-8 visible satellite image remapped over southern Ontario valid at 1602 EDT. Convection had already been initiated along the cold front from the Michigan thumb area to southern Georgian Bay. Clear areas to the east of Lake Huron and to the north of Lakes Erie and Ontario indicate the extent of inland penetration of the lake breeze fronts. The Huron and Erie fronts were later detected by Exeter Doppler as shown above. King radar also detected the Lake Ontario lake breeze front as it moved north (not shown). 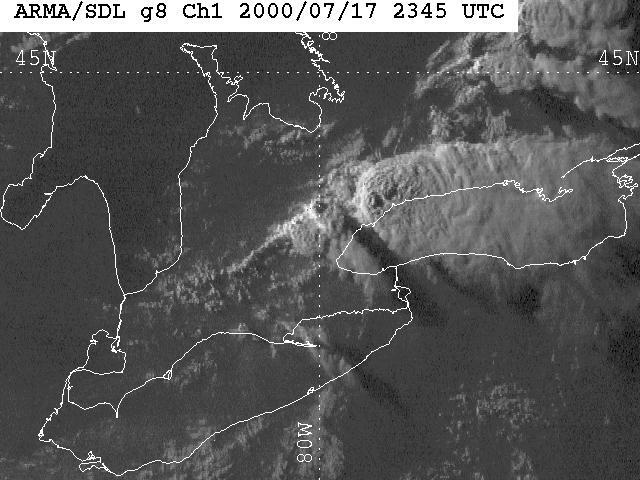 The visible satellite image valid at 1945 EDT, just prior to the time of the tornado in Guelph, shows a large thunderstorm complex north of Toronto and two supercell thunderstorms to the west. The Guelph supercell is the thunderstorm furthest to the west. Note the combined cold front / Lake Huron lake breeze front that appears to feed the Guelph supercell from the southwest. 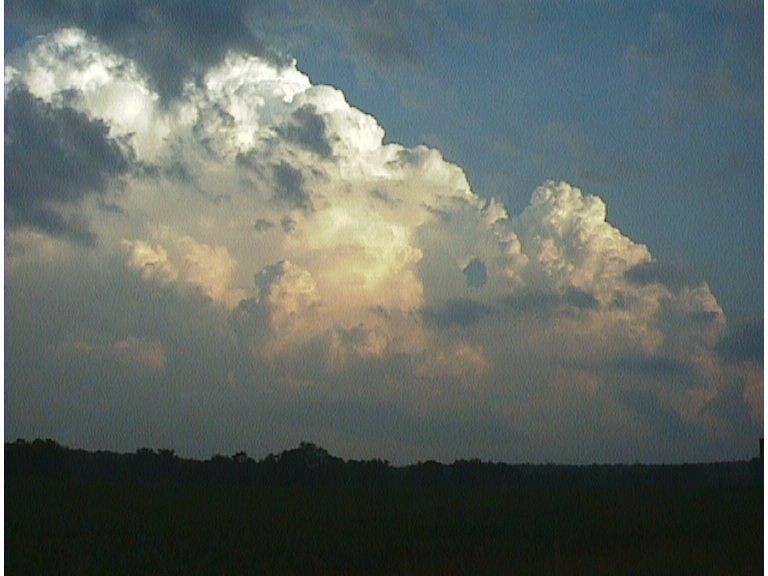 Also, Dave took the following photograph of the supercell over Guelph at 2032 EDT. The photo was taken facing SSW from a vantage point approximately 25 km away (S of Erin). It shows the structure of the rear of the storm including a well-developed mesocyclone (note striations in updraft). There also appears to be at least one thin funnel cloud beneath the dark, rain-free base. After analyzing the damage and witness accounts, it was concluded that a tornado developed over Guelph. 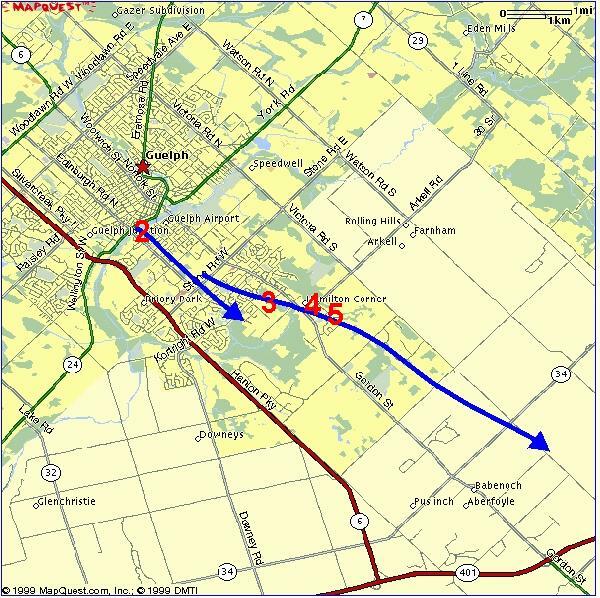 The tornado tracked southeast from Silvercreek Park to southern Edinburgh Road, moved southeast from Rickson Avenue to just east of Aberfoyle. Damage consisted mainly of snapped and uprooted trees, minor structural damage to buildings and crop damage though in several locations there was considerable structural damage consistent with F2 damage intensity on the Fujita scale. The damage path width reached up to 600 m. The path length was about 13 km from 310 degrees. Total damage has been estimated by Guelph Police at roughly two million dollars. Guelph Police and Phil Chadwick / Caroline Floyd of RCTO helped with identification of damage areas (a comprehensive companion report has been prepared by Phil Chadwick and Caroline Floyd and is available through the Toronto weather office). Satellite images were prepared by Patrick King. Radar images were prepared by Peter Rodriguez. Additional information was provided by the Guelph Mercury, the Guelph Tribune and the Toronto Star. Planetary Scales. J. Atmos. Sci. 38: 1511-1534. DETAILED DESCRIPTION: Heavy rain, followed by tremendous force of wind, 'swirl' ripped through, splintered fence, tossed into field; twisted off small trees; left swirl patterns in soybean field in swath. DETAILED DESCRIPTION: Cloak room on church destroyed, large trees down on hydro wires, roof damage, heard 'train noise'. DETAILED DESCRIPTION: Church building damaged, glass coat room destroyed, trees down on cars, siding torn off building. EVENT LOCALE: Guelph, Stone Rd. DETAILED DESCRIPTION: Southern side of Guelph, trees down, sidings of houses ripped off, damage to cars. Severe Thunderstorm Watch issued for Wellington County (including Guelph and vicinity) at 1650 EDT. Severe Thunderstorm Warning issued for area at 1711 EDT. Standard mention of possibility of tornadoes in bulletin. Warning continued at 1849 EDT and again at 2035 EDT. No tornado warning was issued for Wellington County.